This is to pay for tables that you have been told are being saved for you. Please DO NOT purchase a table UNLESS you have been told by Cinema Wasteland that you have a table that needs to be paid for. Good any one day Friday, Saturday or Sunday. Please Note: You will NOT be mailed tickets/passes/badges etc. in the mail. 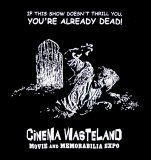 You will be emailed a receipt from Cinema Wasteland in the next week or so (not the generic website email). Your receipt is your ticket. Bring your receipt to the convention and exchange it for your daily wristband. Movies and events run until 2:00am on Friday & Saturday nights! Single day admissions are $15 until May 31st, 2019. From June 1st thru September 6th, 2019 single day admissions are $20 each. * PLEASE NOTE: Advance Cinema Wasteland tickets are NON-REFUNDABLE if for any reason you can not make the show. Please understand this BEFORE sending ticket payment. Your receipt is your ticket. Bring your receipt to the convention and exchange it for your VIP Pass. Friday October 4th - 4:30 pm - 10:00 pm - VIP pass holders are admitted at 4:00 pm on Friday. Advance VIP Passes are $35 until May 31st, 2019. From June 1st thru September 6th, 2019 VIP Passes are $40 each. VIP passes are available at the door Friday for $55 each.